Stellenbosch is the second oldest town in South Africa and a prime holiday destination in the winelands of the Western Cape. Van der Stel the Commander of the Cape was given the task of expanding the colony and providing supplies for ships rounding the Cape on their way to the east. Providing provisions was one thing but van der Stel thought that it would be nice to give the ships some variety and that wine would be a good choice. In 1679 Simon van der Stel and his entourage visited the Stellenbosch area and seeing that the climate and soil were suited for agriculture decided to establish a town in the area. 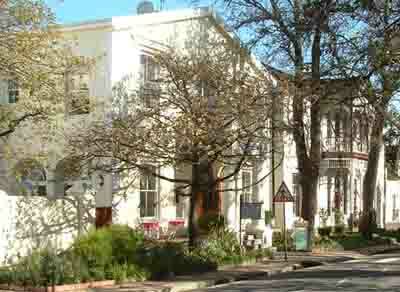 The streets of Stellenbosch were laid out along the banks of the Eerste River and the settlers who were granted land were encouraged to plant oak trees along them to provide shade. The streets are still lined with them today. Stellenbosch got its name from the first visit of van der Stel to the area when he camped on a small island in the middle of the Eerste River and named it Stel en Bosch (Stel and Bush) after himself. The island later disappeared during a storm but the name Stellenbosch lived on in the valley. 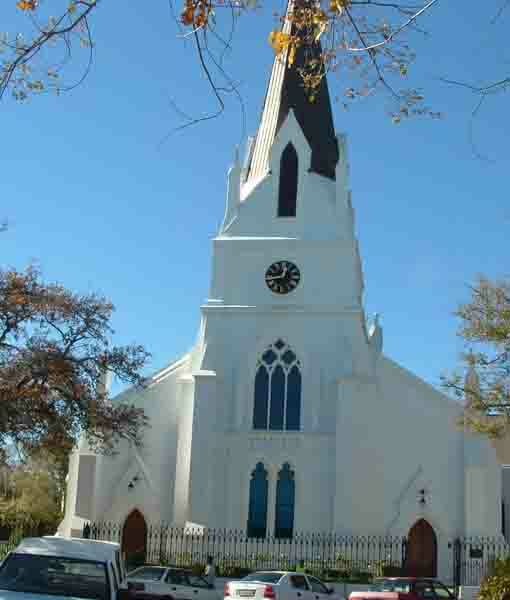 A pioneer church was built in Dorp Street in the late 1600's but was destroyed by fire in 1710. On its site a large house was built that today has been coverted into the Oude Werf Hotel. Part of the building is built on the foundation of the old church. A piece of the old foundation which was discovered recently when some renovations were being done has been left uncovered and can be viewed by visitors to the hotel. When the pioneer church burnt down a Dutch Reformed Church was established a short distance away at the top of Dorp Street. The church has had many changes to its structure over the years and today is a neo-gothic structure with a tall spire. It took many years to build and it was finally completed in 1866 when the spire was built. The gardens of the church are beautifully laid out and there are some old tombs dating back to the early 1800's which house the last remains of some of the ministers who served in the church. They are strange looking cement structures which are partially buried and have half moon shaped roofs on them. The town's streets are filled with historical buildings and in Dorp Street you can see the longest row of historic buildings in the country. All of them beautifully restored. Some of the streets still have the deep furrows which were built to provide water to the houses of the area in the early days. 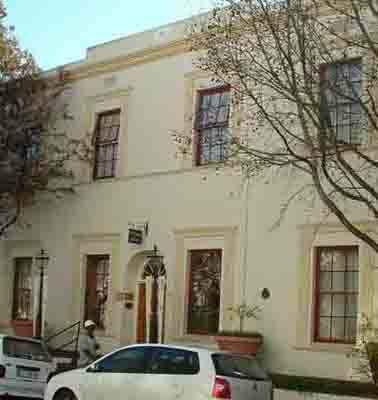 Cape Dutch houses abound in the streets of Stellenbosch. One of them, the Kerkhuis Utopia (Church House) was built in about 1800 and was beautifully restored in 1962 and still stands today. It has been declared a National Monument. 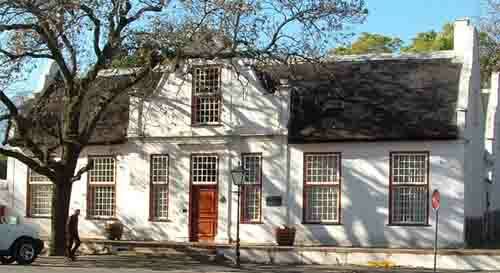 In Reyneveld Street is the village museum which is a collection of houses which have been restored and furnished in period styles. They show the differences in the houses of the poor and rich back in the 1800's. Even the gardens have been planted with the flowers, shrubs and trees that would have found in the original homes. Stellenbosch might seem to be an old town but in fact is not. It is the home of the University of Stellenbosch and in term time the streets are filled to capacity with students rushing to and fro to lectures. Because of the students there are plenty of restaurants, bars and coffee shops scattered all over town. They even have a night club or two as well. Stellenbosch being in the heart of the Cape Winelands boasts forty one wine estates within its boundaries and many more in the surrounding valleys of Franschhoek and Paarl. Spier is one of the estates a short distance out of town which has become extremely popular over the last couple of years. It has wine tasting facilities and a lovely big duck pond with lawns where one can enjoy picnics and watch the ducks and geese get up to their antics. Very good for a family outing. Stellenbosch has much to offer its visitors and to really enjoy the area one should stay a few days and explore the historic streets, shops and wine estates. Here is what you will find in the Stellenbosch surrounds. A drive along the wine route near Stellenbosch can be very interesting. Not only will you see wine farms with thousands of hectares of grapes growing on them but many other intereting things as well. Driving along the Lynedoch road towards the Spier Wine estate there is a large farm dam with a number of hectares of open veld. 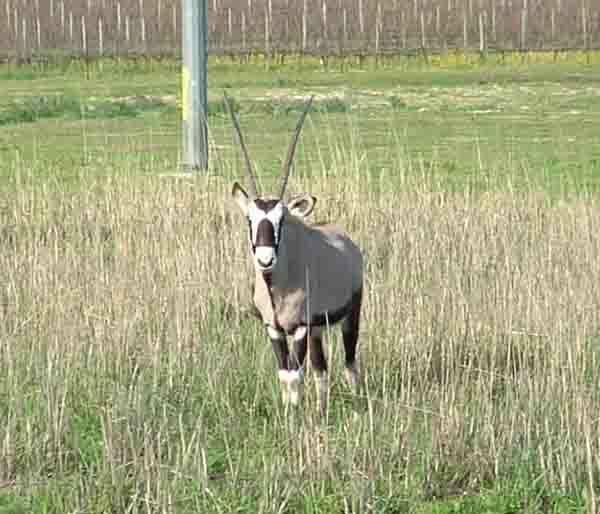 I was surprised to see all the wild antelope that were roaming about there. There were Bontebok and Springbok grazing so close to the road that passersby could stop and get a photo or two of them. One antelope which I could not identify had very large horns and might have been a reindeer turned out to be a fallow deer taken off Table Mountain. A kilometre further on we came across another field that had a number of zebras and wildebeests grazing on it. Lynedoch road seems to be a road for wild animals! “ Eagle Encounters” a bird of prey rehabilitation, education, conservation and eco-tourism centre at Spier. 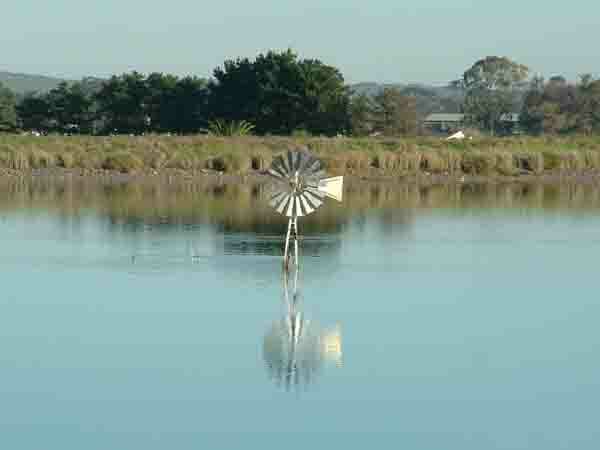 Leaving Spier and driving a few kilometres further south I came across the most hard worked windmill I have ever seen. Next time you visit Cape Town do take a trip along the wine routes of Stellenbosch and enjoy the wines, animals and scenery.